Q. Do you travel outside of Geraldton? A. Yes we cater for guests all around the State and have a team that are able to cater for events large or small. Q. How far in advance should I book an event? A. So you are not disappointed try to get your booking in 12months ahead, as you are more likely to secure the date and venue of your choice. No matter of the lead in time, we have a large team of chefs and wait staff – so where we can we will do our best to accommodate any last minute bookings. Q. What size functions can you cater for? A. The minimum for deliveries is 10 guests. Onsite has a minimum of generally 40 guests – though we are flexible with this number and would welcome the opportunity to discuss your requirements. As for a maximum – this depends on your venue. The largest function we have catered for to date is 2,500. Q. Do you cater for special dietary requirements? A. Absolutely, when confirming your final numbers, we confirm all dietary requirements. Then we adapt your chosen menu to that particular guest and prepare their special meal. As an example we can craft a complete gluten free or vegan menu if desired. Q. What are the costs associated with catering for children? Q. What is your deposit and payment policy? A. For Weddings a booking confirmation fee of $250 is required and the balance is required on the week leading up to your magical day. All other functions – no deposit is necessary, but payment prior to your function is required, unless a 7 day account has been arranged. Q. Do you have AV equipment? A. We do – we have a projector, screen, PA and lectern for hire. Please advise us of your requirements, if your events require additional AV equipment we can take care of that for you. Q. Do we arrange the hire equipment? A. Once we have met and have a confirmed menu, we are happy to organise all your catering hire equipment. This includes crockery, cutlery, glassware, tables, chairs, linen and bar requirements. Q. What does our menu price per person include? A. The menu price per person includes our qualified chefs to prepare and plate your selected menu and based on your numbers the Dalgleish Catering wait staff for the delivery of table service. Our team take care of clearing the tables, washing the crockery and cutlery and restacking back into hire containers ready for you to return. We also clean the kitchen, including sweeping and mopping. Q. When do you need final numbers? A. 7 working days prior to your event, numbers will be required so we can finalise the necessary produce and staff. This final number will be the number we invoice you for. Unfortunately, after confirmation is made, the number cannot be reduced. Q. Who sets up the tables? A. Our menu price is not inclusive of the setting of your tables. We are more than happy to quote on providing this service or recommend you to an event planner to assist. Q. Do your staff wear a uniform? Q. Do you have beverage packages? A. We have packages available to suit your requirements. Package 1 BYO – Save money with this popular option. 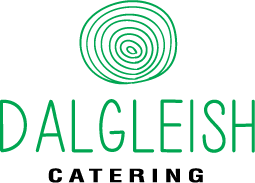 Dalgleish Catering provide RSA trained beverage staff to serve your guests. We are happy to help with alcohol consumption quantities. Package 2 Complete Beverage Package – We will take care of the occasional liquor license application, purchase drinks as selected from our beverage list and provide all RSA trained staff. Beverage costs are charged out based on consumption and costs are finalised post event. Q. After the function, do we pack down the venue ourselves? A. If you have requested us to deliver a complete pack down service additional to your menu selection – then yes, you can go home straight after your event and we will take care of this for you. If you have selected this option, we will take down your decorations and pack away the tables and chairs. This does not include any cleaning of your chosen function centre.